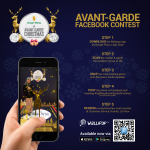 Another blissful and jolly celebration as Sungei Wang celebrates this festive season with the theme “An Avant-Garde Christmas”. The joyous celebration at the mall commenced from 24 November and will run through to 26 December 2017. Step into Sungei Wang Avant-Garde AR Corner to experience the Avant-Garde mood with the specially designed 3D AR Corner. Shoppers can download and pose with the 3D Reindeer. 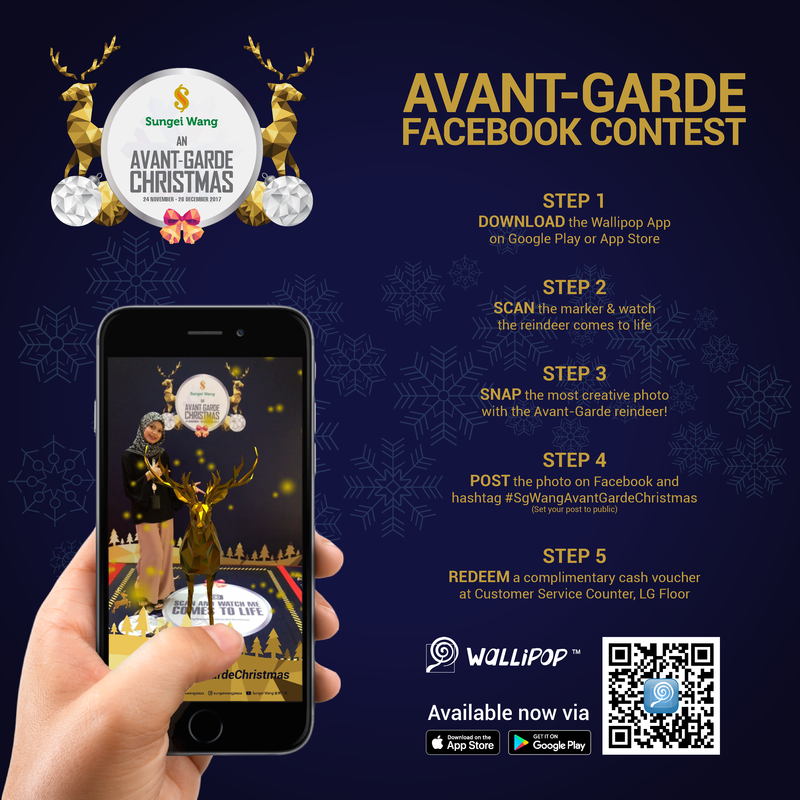 They will be rewarded with cash voucher from The Bowls after posting the photo in Facebook with the hashtag #SgWangAvantGardeChristmas. Three (3) winners with the most “likes” will get a Christmas hamper from Sungei Wang. So, do not miss this chance to set with something 3D and animated. Great news for Epicism fans as they will be here in Sungei Wang to meet the fans on 2 December 2017. Famous for their cheeky personality and funny videos, Sungei Wang is brimming with excitement to have these talented Malaysians to make this Christmas more memorable. For the benefit of all Epicism fans, they can have the chance to meet them personally and have games interaction session with their idols. Be sure to mark your calendar and do not miss the chance to meet them! Ivan (Fly FM) will be joining us this Christmas on the 16 December 2017. Come and have fun with us for some game sessions together with our guest performer, Ding丁丁 as she will amaze the shoppers with Christmas caroling songs. 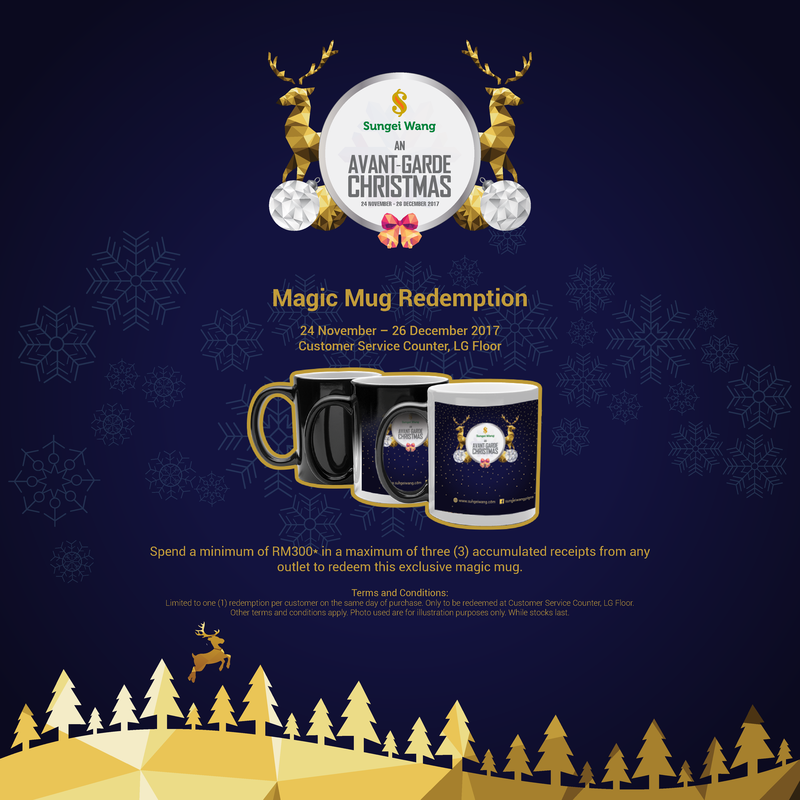 Get Sungei Wang special edition Magic Mug when you spend RM300 or above in a maximum of three (3) accumulated receipts from any outlet on the same day. When you shop for your favourite gifts in Sungei Wang, remember to approach our friendly Customer Service for a free gift wrapping! 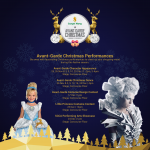 “An Avant-Garde Christmas” is proudly presented by Sungei Wang with The Bowls as Sponsor and SCCA as Official Partner. It is also supported by Fly FM as the Official Radio.